The plum jam is ready and it's delicious. You just can't beat home made, especially when it's with fruit from your own garden. 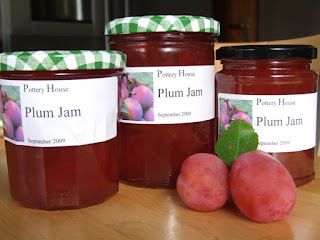 If you are staying at Pottery House in the coming months and would like to try the plum jam, mention that you've seen it on the blog and we'll make sure it's out for breakfast the next morning. 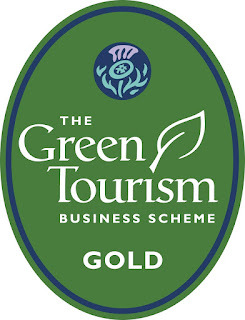 Every two years we have an inspection by the Green Tourism Scheme. We had our inspection back in August and we're delighted to announce that we have maintained our GOLD standard. completion of our water recycling system so we can use water from our washing machines to water the garden.all showers in the house now have Mira Eco-shower heads, which use up to 75% less water (and therefore energy to heat the water) than standard shower heads.the new lighting in the large double room is all compact fluorescentwe replaced the cooker and fridge as they were very old and the oven was next to the fridge/freezer. 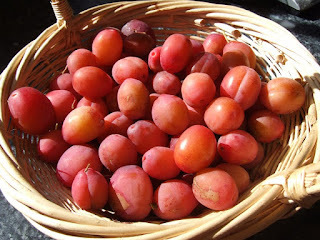 We've been away for a couple of days, and returned to find many of the plums from our tree laying on the ground, after some strong winds. So time to start off some plum wine. If you look back in this blog you can find the plum tree photo, all covered in flowers. It's has turned out to be a bumper crop this year, plenty for jams and pies still left on the tree. There's been a great deal of rain in the area for the past 48 hours, so today we went to see the Falls Of Foyers, a short drive from Dores. 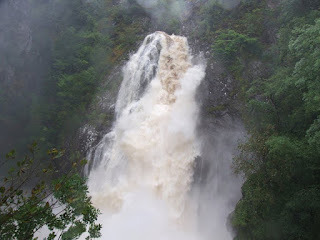 It was spectacular, never seen so much water coming over the falls before.